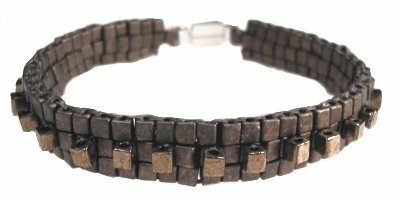 This was the first bracelet I made using the refined technique based on how I had beaded the original cubes cubes necklace. As anyone who has seen me work can tell you, I'm not one for going back and embellishing afterwards- I much prefer to finish as I go. Determination to find ways to do this has stood me in good stead as I also used this as a starting point for my Fabulous Fringes series. Therefore I was delighted to have found a way to do away with embellishing the bracelet afterwards; instead working out how you can add the focal cube beads as you go along. I was delighted when I found the box clasps that I use to finish these bracelets as I feel they work perfectly with the design. Instructions for this piece are available in my Cubed Cubes instructions.